Italian investments in roads and bridges sank dramatically compared to other large European economies following the 2008 economic crisis, never fully recovering, according to the OECD. 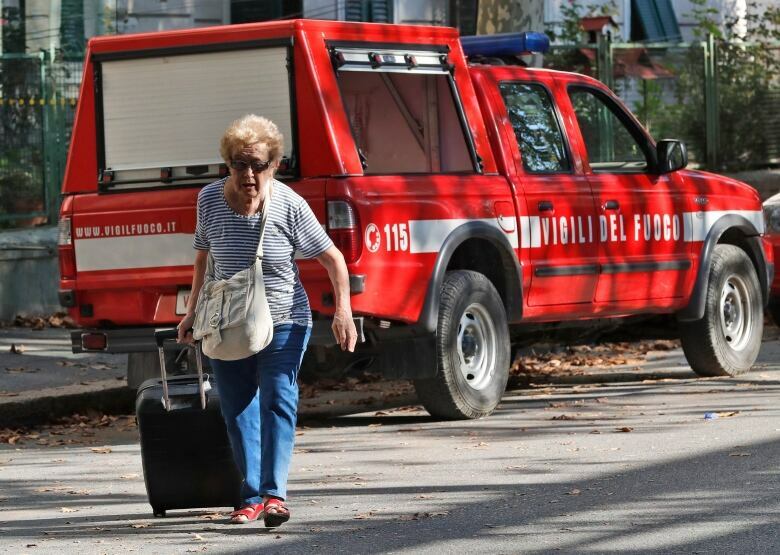 While the disaster in Genoa was the deadliest in recent years, Italy has seen other bridge and highway collapses that have raised alarm about the state of its aging transportation infrastructure. The 51-year-old Morandi Bridge was a key artery that linked highways to Milan and France, a vital lifeline for both commercial traffic as well as vacationers bound for the mountains and famous Mediterranean beaches. "When it was inaugurated, it was vaunted as an engineering achievement, representing the most advanced technology and a model that Italy spread throughout the world," said Antonio Occhiuzzi, president of Italy's CNR society of civil engineers. "It was a project that was constantly under surveillance," he said. "Notwithstanding all these efforts, it came down. It is a little metaphor for the country." Designed by Italian engineer Riccardo Morandi, its unusual features included concrete-encased stay cables, which he used in several of his bridge designs instead of the more common steel cables. Experts say the concrete can deteriorate relatively quickly. "About the project, there were a lot of concerns since the very beginning," said Enrico Musso, a professor of transport economics at Genoa's University of Studies. "On this kind of project, only three bridges were built around the world, and the other two already had serious problems." One built in Venezuela partially collapsed two years after its opening after being struck by a tanker and killing seven. Another built in Libya and opened in 1972 was shut down in October 2017, according to the Italian news agency ANSA. Many technicians had advised replacing the Genoa bridge, too. In the wake of Tuesday's collapse, prosecutors are investigating both its possible design flaws as well as maintenance, although they have not identified any targets. Some in the government blame Italy's partially privatized highway system, alleging that too much emphasis is put on profits. The disaster, in which dozens of vehicles plunged 45 metres when part of the bridge collapsed, is spurring calls to retrofit or replace others in Italy that are operating well beyond their expected lifespan and despite technological advances. A survey published this week by the CNR engineering group cited four other major highway overpass collapses in the last two years alone — all related to structural weakness. They caused three deaths and four injuries. 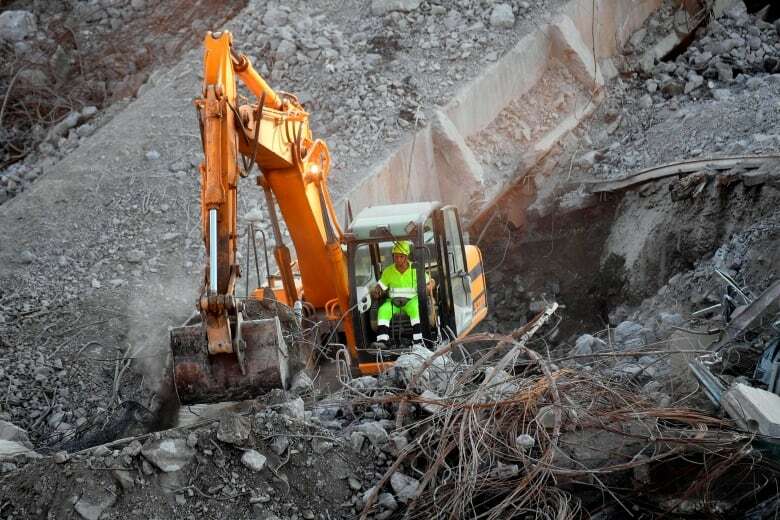 The survey excluded smaller incidents that did not cause injury, but Italian media counted three more highway collapses going back to 2004 that caused four deaths and four injuries. "What are worrisome are the ones built in the 1950s and 1960s, most of which are at the end of their lifespans," Occhiuzzi said, adding that they often are difficult to retrofit efficiently and probably cheaper to replace. He also noted that the recent collapses occurred in northern, central and southern Italy, defying stereotypes of a well-maintained, wealthy north versus a neglected south. 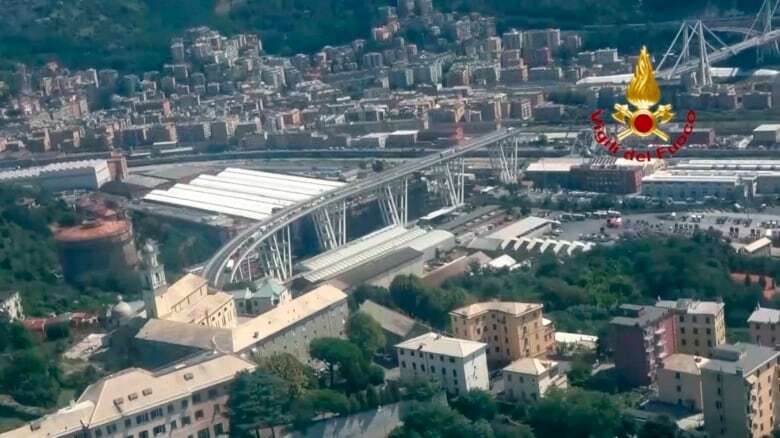 The government is focusing blame for the Morandi Bridge collapse on the Autostrade per l'Italia company operating the A10 highway that includes the bridge, citing a lack of maintenance, and is pledging to revoke Autostrade's highway concession. Cabinet ministers have said there was a cozy relationship between the knitwear making Benetton family that controls Autostrade and previous governments that prevented proper oversight. 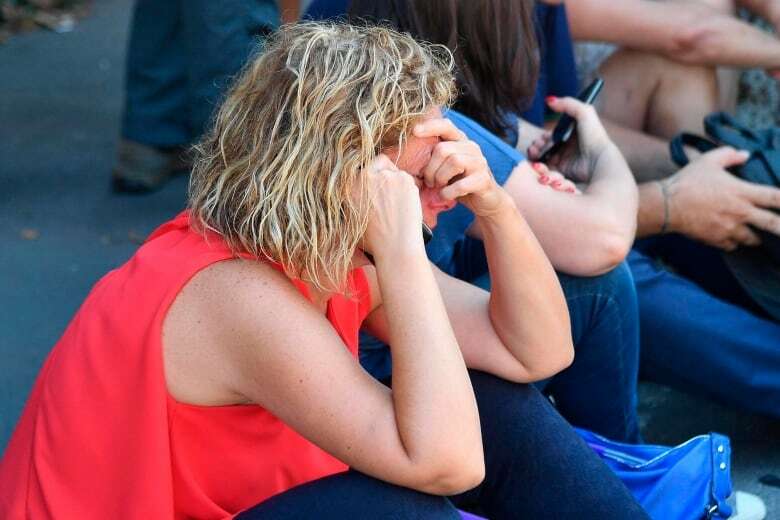 In a statement Thursday, Autostrade said it was prepared to take "rigorous action," beyond any criminal charges, if it emerges that any of its managers or workers were in any way responsible for the disaster. It said it was conducting its own internal inquiry and co-operating with authorities. The company expressed "its closeness to the families of the victims and the injured," and added that "our apologies are in our words and deeds." The government has granted two dozen companies the right to manage Italy's 6,003 kilometres of highway and more than 1,034 kilometres of bridges and viaducts and 865 kilometres of tunnels. Another 26,000 kilometres of provincial and toll highways and interchanges are controlled by the state-run ANAS agency. Autostrade, by far the biggest of these private companies, controls 3,020 kilometres of highway. The Morandi Bridge was scheduled for a major retrofit. 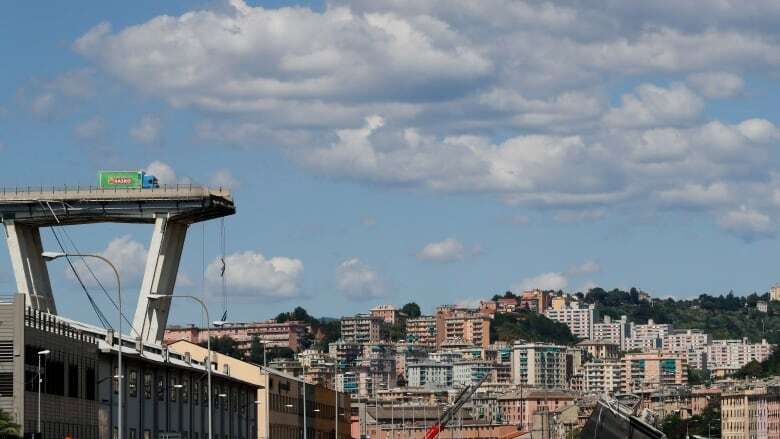 The business daily il Sole 24 Ore said the 20 million euro ($30 million) project aimed to reinforce two vertical support structures on the span, including one that collapsed. Interior Minister Matteo Salvini also has blasted European Union spending rules. But the EU says that not only has it "encouraged investment in infrastructure," but also has approved 2.5 billion euros ($3.74 billion Cdn) for Italian infrastructure, including roads, in the 2014-2020 budget, and that the it approved in April another $12.7 billion investment plan for Italian motorways, including the Genoa area. Still, figures from the Organization for Economic Co-operation and Development show that Italian investments in roads sank most dramatically among the top five European economies after the 2008 economic crisis, never fully recovering. From a level of just under $20.3 billion a year in 2007, second only to France, Italy dropped to $5.6 billion in 2014. In that period, Occhiuzzi said, Italy pulled back dramatically on both infrastructure and research investment. But he said retrofitting old projects hasn't been prioritized because it is not glamorous and requires studies of old technology that no longer exists. He also said assigning blame for collapses always involves more than one factor. Building roads, bridges and viaducts on the 1,200-kilometre Italian peninsula and two major islands are part of the complexity of resolving the infrastructure issue. The Morandi Bridge embodied this geographical challenge. Genoa is tucked picturesquely between the mountains and the Mediterranean, and motorists exiting a tunnel near the city make a gentle descent toward the Ligurian coastline. "Everyone loves the Italian panorama characterized by a rugged landscape and green vistas near the sea. But that beauty is also its weakness," Occhiuzzi said.